A campaign that is raising concerns about planned oil exploration off the Algarve coast has been supported by a donation from a British wildlife holiday company. 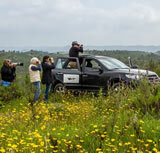 A group from Honeyguide Wildlife Holidays has donated £500 (€550) to SPEA, Sociedade Portuguesa para o Estudo das Aves. SPEA is part of the coalition Plataforma Algarve Livre de Petróleo (Platform for an Algarve Free of Petroleum) that is campaigning against oil and gas exploration in the region. An area in the Baixo Alentejo has been deemed unique, so it must be preserved, thanks to UNESCO. The Castro Verde Biosphere Reserve is home to some 200 species of bird, including the great bustard (below) a species with 60% of its population found in Portugal and Spain. A new paper just published by Arrondo et al in the journal Biological Conservation analysed the foraging strategies of 71 griffon and cinereous vultures tagged in Spain and foraging in the Portuguese-Spanish border region - which is largely defined by river valleys and is not associated with any abrupt or systematic change in terms of climate, topography or land cover. An exciting week for birding and nature enthusiasts as the Sagres Birdwatching Festival returned on October 4th and runs until the 8th, backed by Vila do Bispo council and organised by SPEA. Events are dedicated to nature, birds and outdoor fun. In Sagres, "you can see almost everything", says André Pinheiro from Almargem, one of the promoters of the initiative who says that it’s the unique landscape which makes this festival not only for bird watching, but for nature in general. While the Algarve in summer is more renowned for its holiday beaches, increasingly it is gaining a reputation for the wealth of beautiful birds that also migrate here for the season – but unlike the majority of the holidaymakers, they arrive from the south and not from the north. Several, such as the impressive Alpine Swift and its smaller relatives, the Pallid and Common Swifts, can be watched while prostate on the beach as they zoom around their nest-holes in the cliffs. Others, such as the delicate Subalpine Warbler or the striking Black-eared Wheatear, will take a more determined search inland, but more than repay the effort. The head of Portugal’s Food and Veterinary agency has received an application to authorise diclofenac for veterinary use. The problem here is that as well as being used in medicine to treat sick cattle, the drug is fatal to birds that eat carrion. Birdlife Europe and Portuguese environmental organisations already have appealed to Portuguese government not to authorise the drug, saying it threatens already rare species such as the Black vulture and the Imperial-Iberian eagle. The wetland area that gives the city of Lagoa its name is being erased by earth-moving machinery that is preparing the land for an, as yet, unknown development - but most likely to be a new Continente supermarket. Thousands of Glossy ibis are being pushed from their winter habitat of Alagoas Brancas as the natural area to the north of the Aldi and Apolonia stores is being destroyed.